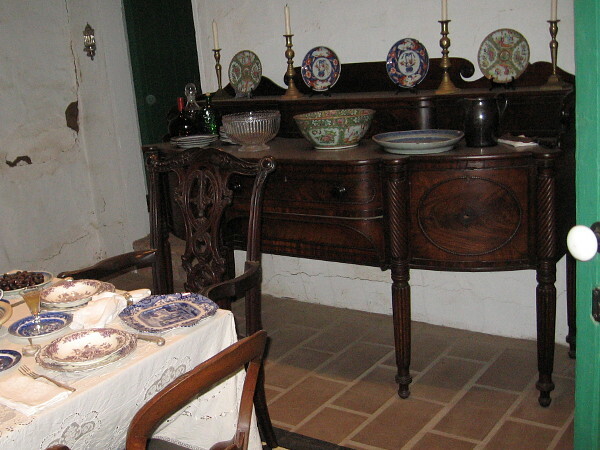 Photos of restored rooms inside Casa de Estudillo. – Cool San Diego Sights! 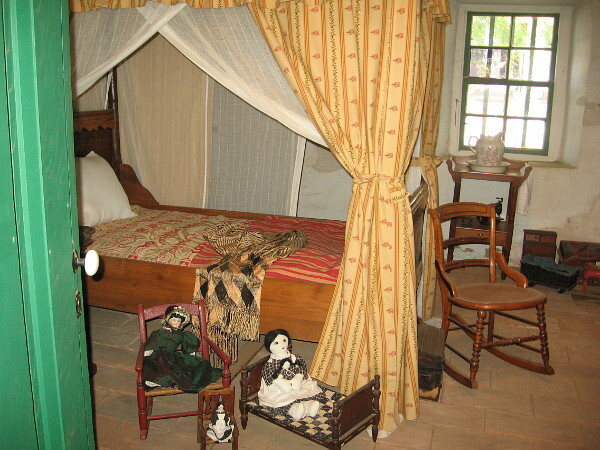 Photos of restored rooms inside Casa de Estudillo. 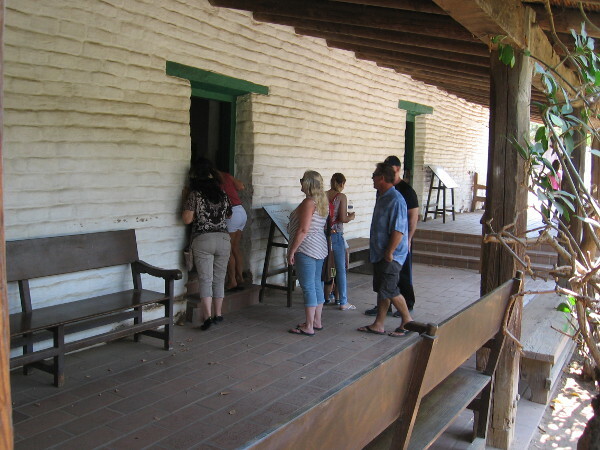 Visitors to Old Town San Diego State Historic Park look into a restored room of La Casa de Estudillo. Four years ago I posted photos of La Casa de Estudillo, a famous adobe house in Old Town San Diego State Historic Park that was originally built in 1827. 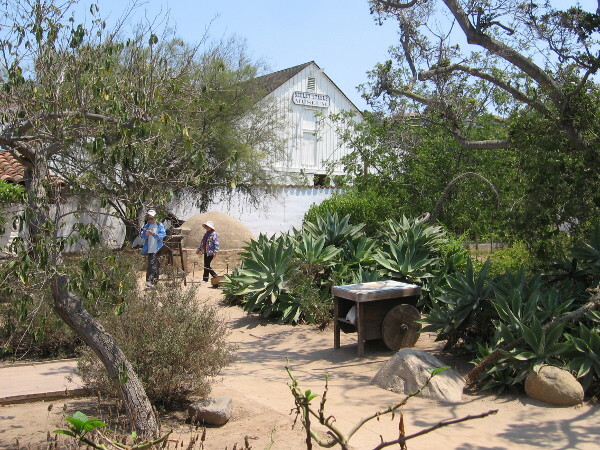 That blog was called Ramona saved Casa de Estudillo in Old Town and concerned the fascinating history of this structure. Over time various parts of the casa have undergone restoration and new rooms have opened up to public view. These rooms now appear furnished as they once might have been, in the very early days of San Diego. 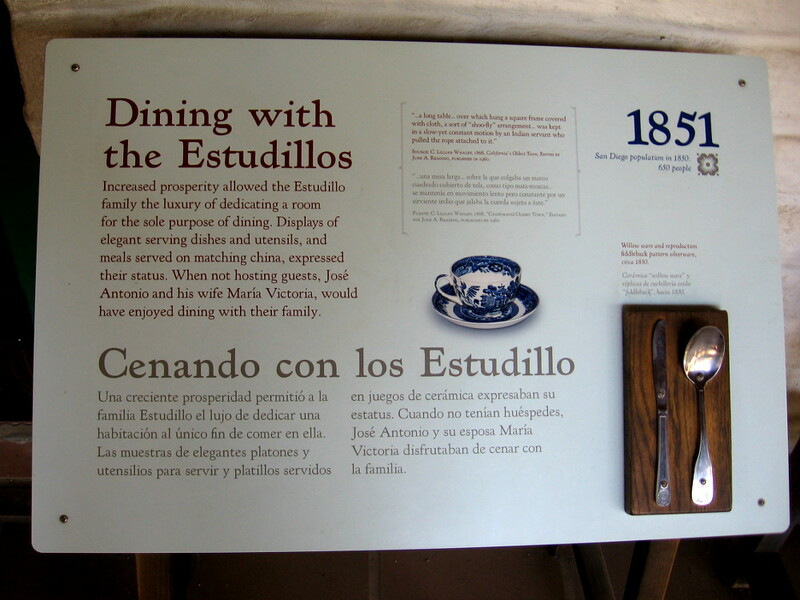 Sign describes the dining room of La Casa de Estudillo. The eventual prosperity of the Estudillo family is reflected in their elegant dining room. Expensive furniture and tableware imported by ship from distant places fill the otherwise simple room. Sign describes commerce in the casa. 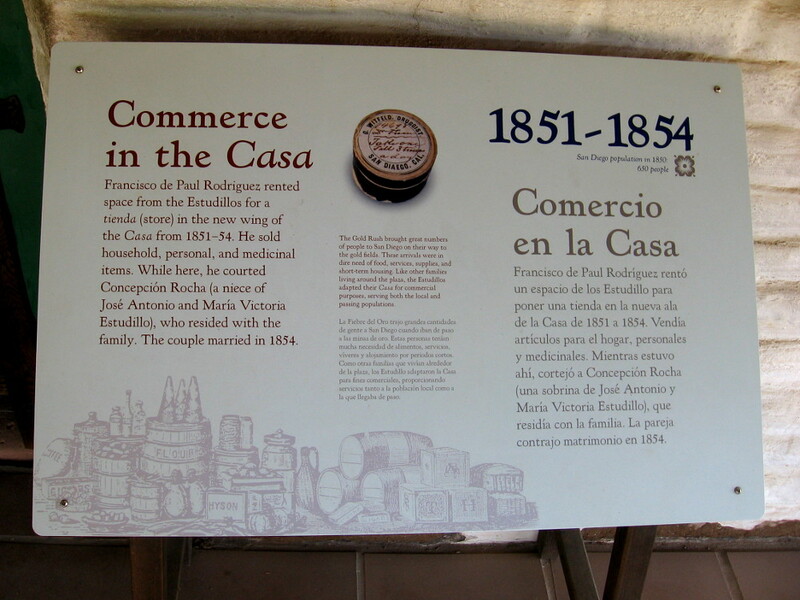 Francisco de Paul Rodriguez rented space from the Estudillos for a store. 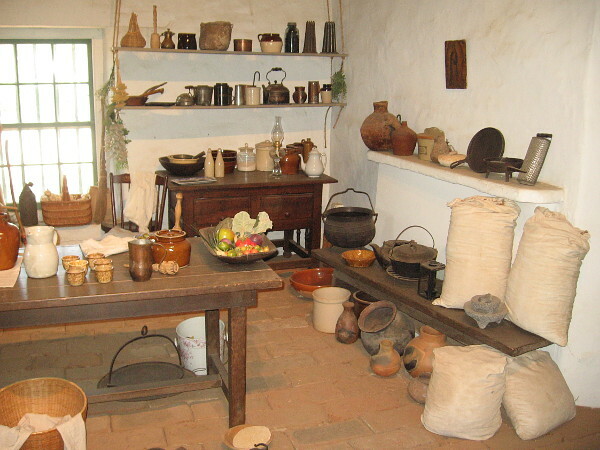 The store, or tienda, contained shelves of goods that might be purchased by the residents of Old Town San Diego. Much of the merchandise came by ship from the East Coast around Cape Horn. 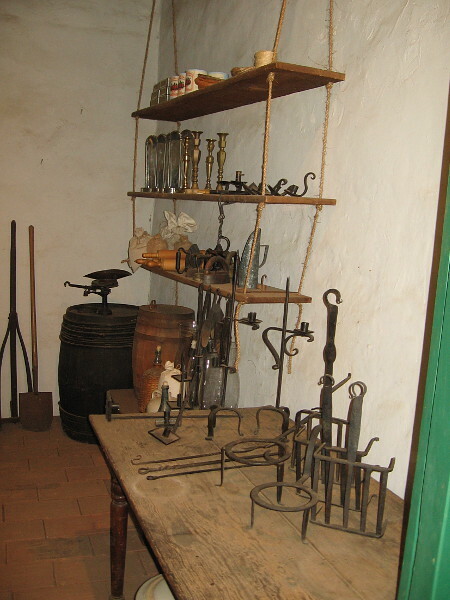 More shelves against one wall contain iron tools and basic furnishings like candlesticks for sale. 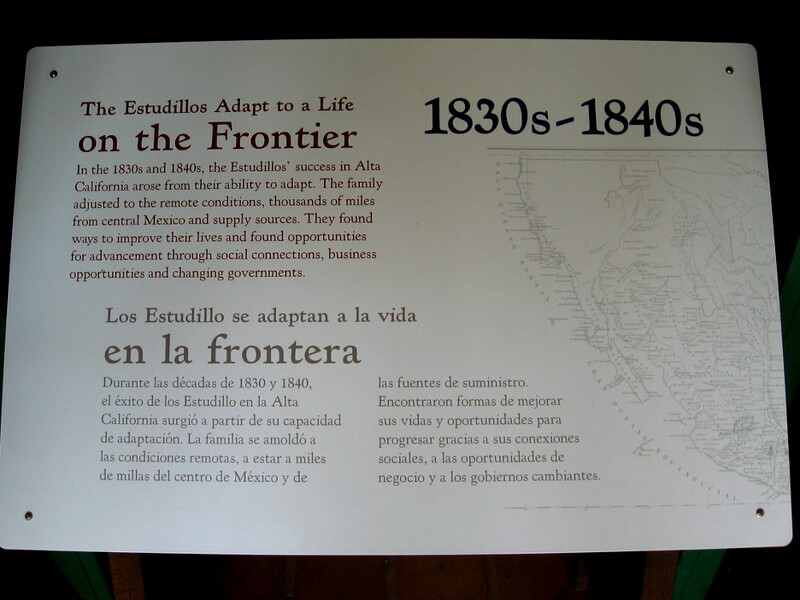 Sign describes how the Estudillos adapted to life on the frontier in the 1830’s and 1840’s. 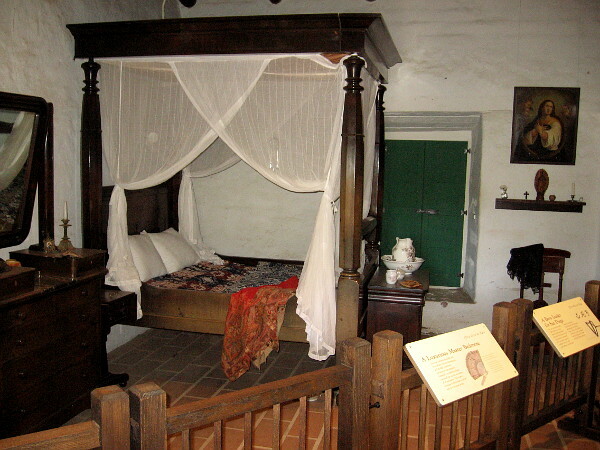 A bedroom inside La Casa de Estudillo contains a wealth of comfort, unusual in early San Diego, which was located far away from developed centers of commerce. 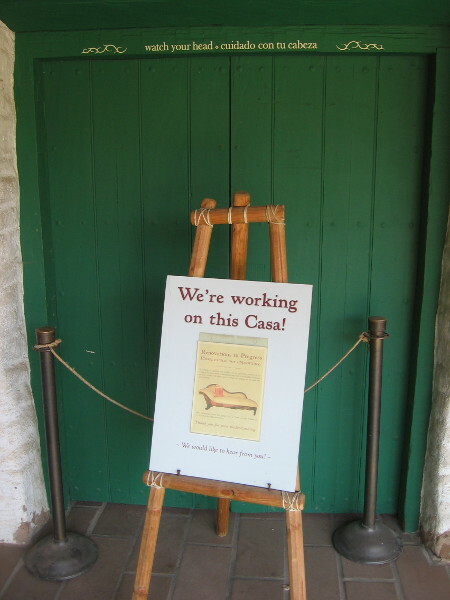 Several additional rooms at La Casa de Estudillo are undergoing restoration. 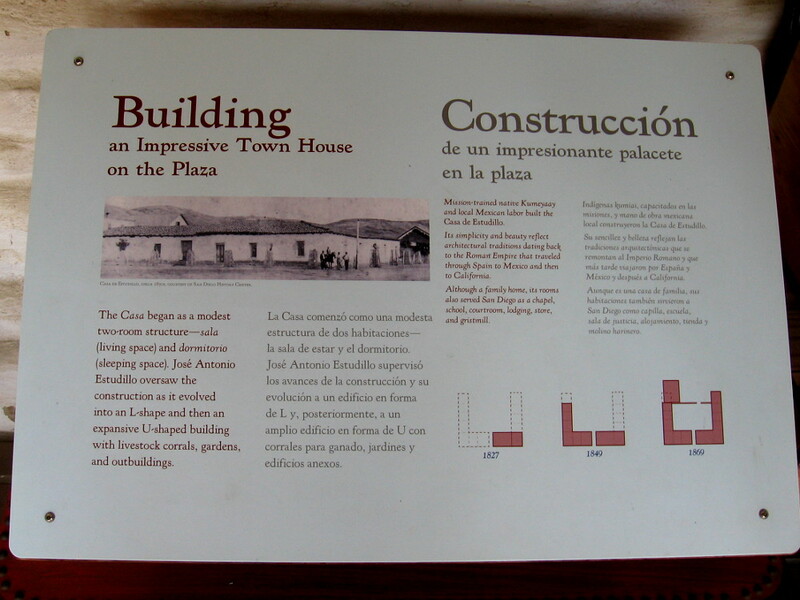 Sign describes how the casa started as a modest two-room structure and eventually grew into an expansive U-shaped building with a courtyard and outbuildings. 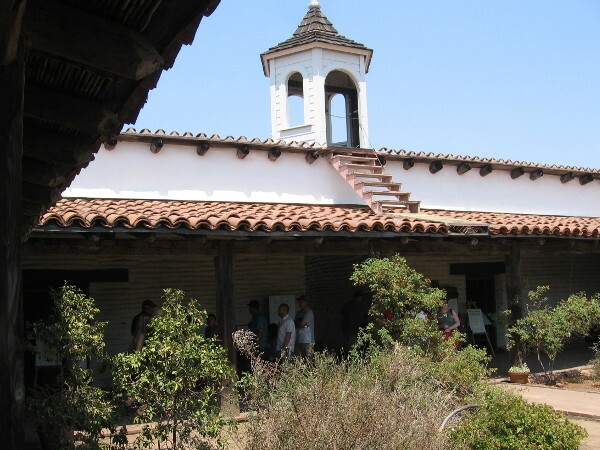 Photo of the Casa de Estudillo’s tower from the central garden courtyard. Looking across the south end of the courtyard toward the outdoor oven and Seeley Stable beyond. 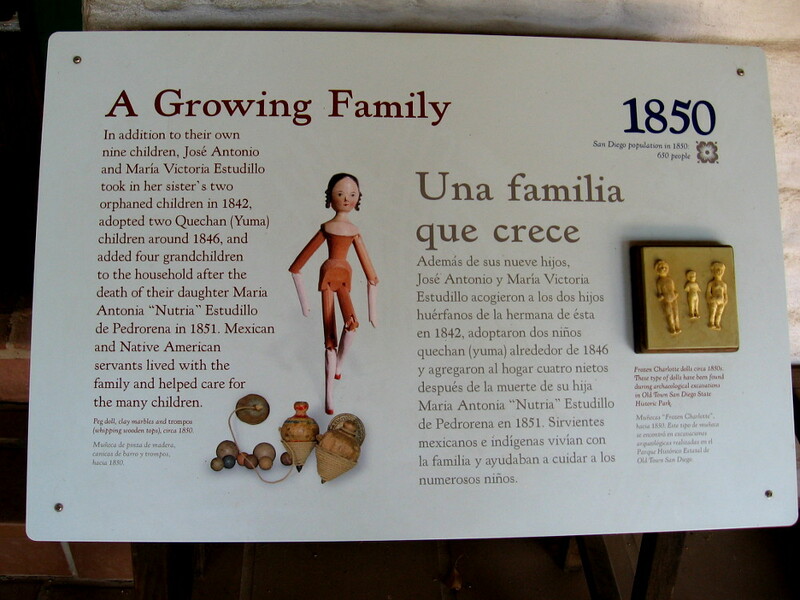 Sign explains how the Estudillos cared for a growing family including many children. 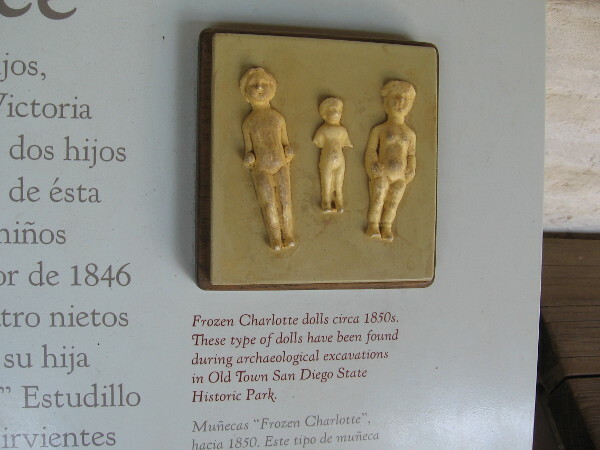 Frozen Charlotte dolls, ca. 1850’s. These china dolls were popular in the Victorian era. A look into the children’s bedroom. 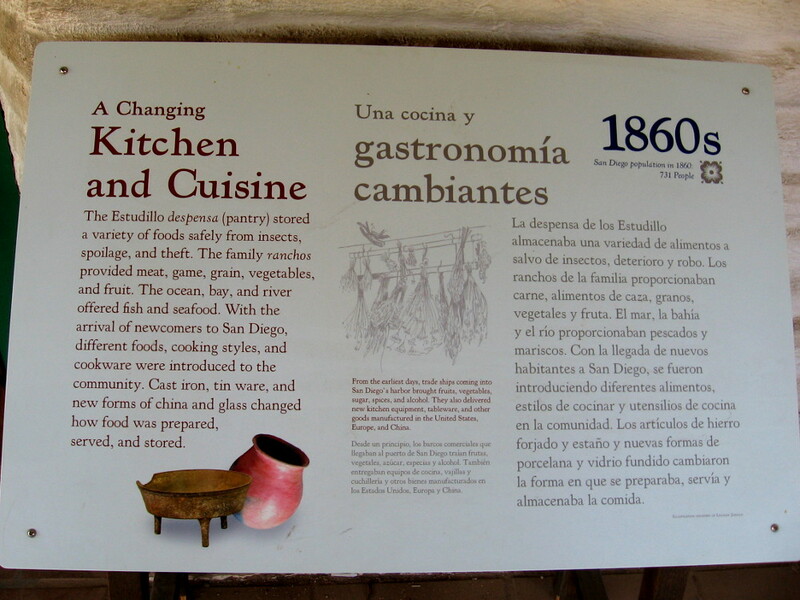 Sign describes the Estudillo kitchen and pantry. 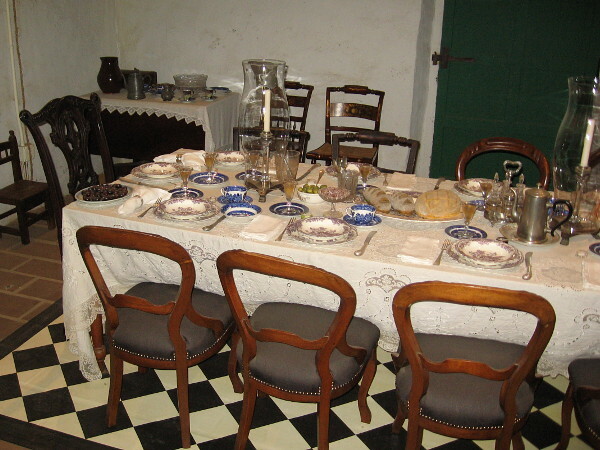 The family’s ranchos provided meat, game, vegetables and fruit. 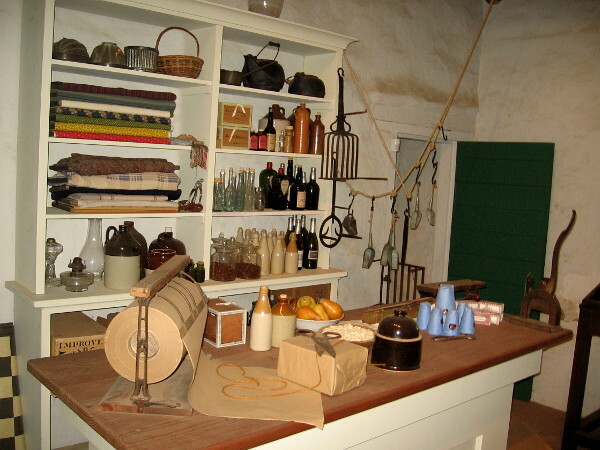 Jars, pots, sacks of flour and fruit are among the many items seen in the rather primitive kitchen. 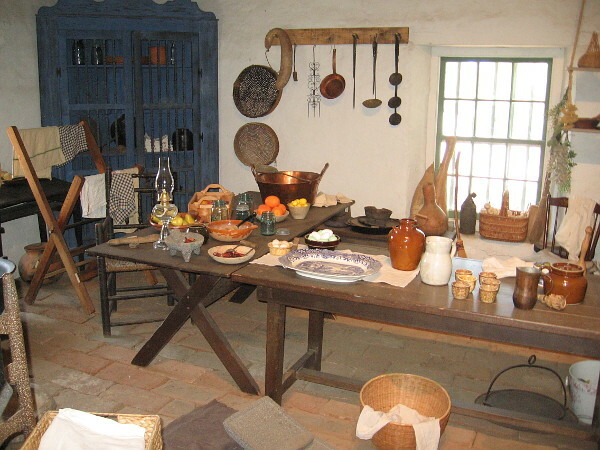 The kitchen inside La Casa de Estudillo provides an idea of what life might have been like in early San Diego. This blog now features thousands of photos around San Diego! Are you curious? There’s lots of cool stuff to check out! Here’s the Cool San Diego Sights main page, where you can read the most current blog posts. If you’re using a phone or small mobile device, click those three parallel lines up at the top–that opens up my website’s sidebar, where you’ll see the most popular posts, a search box, and more! To enjoy future posts, you can also “like” Cool San Diego Sights on Facebook or follow me on Twitter. Previous Previous post: A beautiful walk along Batiquitos Lagoon Trail. Next Next post: An amazing sunset from Seaport Village.